LONG BEACH, Calif. – Two suspicious packages are reported on a merchant marine vessel in the Los Angeles Harbor. A tip sends investigators to a home on Catalina Island where the components to weaponize chemical agents have been located. Two Civil Support Teams are called in to identify and mitigate the threat. Thankfully, this is only an exercise, but one that could easily be reality. The Arizona National Guard's 91st CST and California’s 9th CST joined with the Los Angeles Port Police and the Coast Guard, on Aug. 27, for joint training, focused on maritime functions and small-space maneuvering. CSTs are a force multiplier for local partners, often brought in to handle chemical, biological, radiological, nuclear and high-yield explosive threats. These 22-man teams have the capability to respond to a scene, gather information and samples, analyze questionable substances and provide recommendations to the requesting agency. 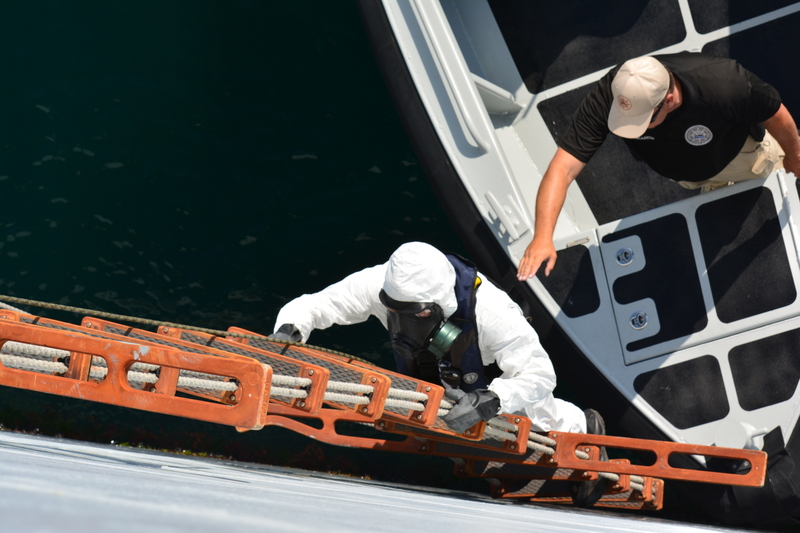 The two teams have expert qualifications to deal with hazardous materials and the additional training on the ocean allows them to be more versatile in their support to local and federal partners. Hawks went on to explain how joint training exercises like these are advantageous for all the partners involved, as they forge a cohesive team ready to respond in the event of a real world incident. When the teams arrive in the harbor, operations personnel and CST commanders, make contact with the incident commander. The rest of the team sets up the command trailer, medical operations truck and prepares a port police boat as a decontamination lane. Meanwhile, others prepare to board the port police boat with gear to analyze and mitigate threats in two locations. During this maritime exercise, a four-person and three-person entry teams consisting of two CST members and additional hazmat personnel from the LAPP, receives their mission brief, boards an LAPP boat in the harbor and heads to their identified locations. As two combined teams board a ship in the harbor, an additional team heads to Catalina Island to analyze and conduct mitigation on the threat there. The teams will simultaneously clear both the ship and the house before returning to the Maritime Law Enforcement Training Center to brief the command and teams on their discovery and subsequent actions to contain and eliminate the threats found there.